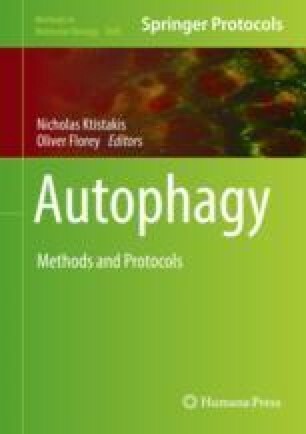 The fluorescence microscopy-based detection of intracellular LC3, p62, and/or WIPI punctate structures is a robust tool to monitor and assess macroautophagy/autophagy in single cells. This method was established for automated high-throughput/content analysis to reliably detect narrow differences in autophagy activity/capacity and to provide screening opportunities for biological and chemical libraries. We apologize to researchers whose work we were unable to cite due to length constraints. Amelie J. Mueller received a predoctoral stipend from the International Max Planck Research School “From Molecules to Organisms.” Tassula Proikas-Cezanne receives grant support from the Deutsche Forschungsgemeinschaft (DFG), SFB/TRR 209 (project B02), and FOR 2625 (project 1).